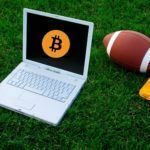 What happens when you combine fresh gameplay, the potential for skill based earnings and Bitcoin? Chopcoin. 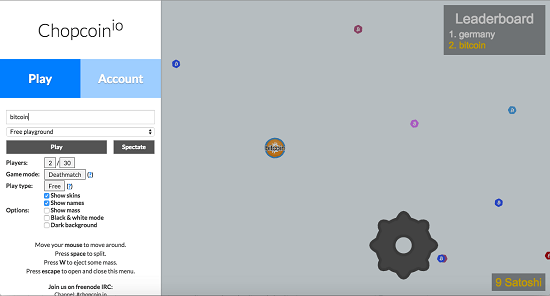 Fans of the Agar.io’s Blob Wars can now enjoy this incredibly addicting game while earning Bitcoins at the exact same time! 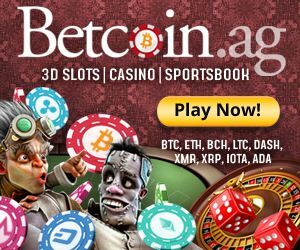 Players can buy into a game for 0.0001, 0.005 or 0.01 BTC and win by being one of the top players at the end of the time limit. The premise of the game is to roam the environment and collect blobs, becoming as large as possible while avoiding competing players who have the capacity to eat you and steal your points. Obstacles are laid out and if you hit them as you travel, your blob will explode into smaller pieces, losing you points and making you easier to devour. Don’t worry though, your blob will eventually rejoin itself but only after a long period of time leaving you vulnerable to attack. 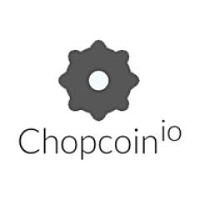 Before you continue to read our review, we recommend visiting www.chopcoin.io to see what we’re talking about. Not only is this game extremely simple to understand but it is also excruciatingly difficult to stop playing. Getting started is quick and easy as there is very minimal information asked of you: an email, username and password is all you need to get started. Once you’ve registered, you’re collecting blobs in seconds whether you’ve made a deposit or not. When you make a deposit, you are required to wait for three confirmations before you can use your funds. Depending on the speed of the blockchain on that particular day and the amount of priority fee you pay on your transactions, you may not be able to play with your funds immediately but this provides ample time to mess around in the free mode or by using the faucet. 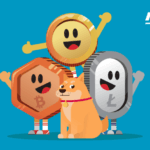 Chopcoin also accepts other crypto currencies like DogeCoin, Litecoin, Monero, Ripple and many, many more so there’s no shortage of buy-in options. The interface is probably the one area they could put some more work into. They do provide more customization options than their free-to-play competitor but it feels like they’ve cut and paste from the original site. A few changes here and there to add to the originality would do wonders. You can choose to see how many points your blobs have acquired, change the background to black and alter the color scheme to black and white for visibility’s sake. 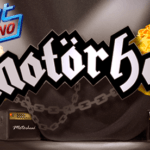 We personally felt that the control was not as good as Agar.io’s rendition but later learned this was due to internet problems. We recommend having a good internet connection before playing this game. Chopcoin, like Poker, is a skill based game. Adding the ability to win Bitcoins into the gameplay makes things a lot more interesting. There are a few moves players can incorporate into their gameplay to ensure that they will have a higher chance to succeed. Building up your blob early by collecting the neutral blobs around the environment is the best way to start off every match. The larger you grow, the slower you move meaning the bigger you get the more strategy you will need to incorporate as your opponents can easily outrun you. Once you’ve grown in size, you will have the option to do one of two things: split and eject. Splitting is an excellent way to absorb an enemy blob by cutting your blob in half and shooting it forward to catch a fleeing enemy. However, since your blob size will be reduced by 50%, you need to make sure you are already colossal in comparison to your opponent. If you’re the small fish in the pond and are on the run you have the option to eject some of your blob (or “mass”) to reduce your size and gain a speed boost. This is only recommended in dire situations where there is no escape. Losing some of your mass is a lot better than losing your entire blob so be sure to use this sparingly. There are mines spread out throughout the environment and hitting them will cause your blob to split into many pieces. Having a large blob made of several smaller pieces is never good as you will be unable to absorb larger blobs so be sure to avoid mines at all cost. When your blob splits it will eventually converge but the larger you are, the longer it can take. While there are no deposit bonuses there is a faucet to play with. Using the faucet allows you to play for free while still giving you a chance to win some Satoshis. For example, in our first run on the faucet we came in second and we were awarded with 0.00003 BTC or 30 microBTC. While this is not a lot, it is free Bitcoins and if you grind long enough you can rack up enough to play in higher stakes gameplay. Why Be a King When You Can Be a Blob? The ingenuity of the Bitcoin community will never cease to amaze us as more and more unique and delightful platforms come into existence. Taking a previously addicting game and adding money into the mix of things makes it more competitive and exciting. Chopcoin.io is definitely hosting the most ridiculously fun and relentlessly addicting Bitcoin game out there. We highly recommend checking them out as soon as possible, you will not regret it.